Ninety-six people die from guns in America every single day. Twelve thousand Americans are murdered each year. The United States has more mass shootings, gun suicides, and nonfatal gun injuries than any other industrialized country in the world. Gun-safety advocates have tried to solve these problems with incremental changes such as background checks and banning assault style military weapons. They have fallen short. In order to significantly and permanently reduce gun deaths the United States needs a bold new approach: a drastic reduction of the 390 million guns already in circulation and a new movement dedicated to a future with fewer guns. 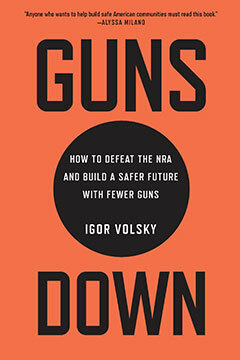 In Guns Down, Igor Volsky tells the story of how he took on the NRA just by using his Twitter account, describes how he found common ground with gun enthusiasts after spending two days shooting guns in the desert, and lays out a blueprint for how citizens can push their governments to reduce the number of guns in circulation and make firearms significantly harder to get. An aggressive licensing and registration initiative, federal and state buybacks of millions of guns, and tighter regulation of the gun industry, the gun lobby, and gun sellers will build safer communities for all. Volsky outlines a New Second Amendment Compact developed with policy experts from across the political spectrum, including bold reforms that have succeeded in reducing gun violence worldwide, and offers a road map for achieving transformative change to increase safety in our communities.